Designed Specifically For Relief from Allergies, Asthma and Tobacco Smoke. Also Recommended for Damp or Greasy Environments. The Allergy Machine is designed for sub-micron control of allergens and airborne contaminants (such as pollen, dust mites, pet dander, and mold) that can trigger allergic and asthmatic distress. True HEPA filtration offers the same comprehensive protection from toxic chemicals, gases and airborne contaminants provided by the HealthMate plus exclusive HEGA technology is particularly effective at removing smoke from tobacco and wood stoves. For homes with toxic, damp, or smoky conditions Austin’s Allergy Machine with HEGA (High Efficiency Gas Arresting) filter material is recommended as mold growth, fire damage, VOC laden, damp or flood damaged environments can saturate and quickly ruin carbon/zeolite filter material. Recommended model for humid and greasy environments like kitchens and damp basement suites. Robust construction including steel housing and toxin-free components thoroughly sealed to prevent leaking of uncleaned air. Five year mechanical warranty for the machine and five year pro-rated guarantee for the exclusive combination of true HEPA/HEGA filter provides the best long term value, performance and build quality in the air purification industry. The Allergy Machine features a unique filter which incorporates 60 square feet of true HEPA technology in conjunction with a special military carbon cloth. This exclusive combination called HEGA, is particularly effective at filtering allergens plus it performs well in damp, greasy and smoky environments. This machine has 3 fan speed settings which draw in air from all four sides totalling over 5 square feet of intake area for exceptional air gathering capacity. On the highest setting up to 250 cubic feet of air is cleaned every minute. Cleaned air exits through a louvered upper outlet on one side of the housing. The Allergy Machine incorporates a unique combination of true HEPA/HEGA filtration. It is guaranteed for five years of exceptional performance. removes hair, pet dander, dust, pollen, allergens and mold. This prefilter is designed to be vacuumed from outside of the unit at least once a month. Removes 99.97% of all airborne particles down to 0.3 microns in size (95% effectiveness at 0.1 microns) including bacteria, viruses and harmful micro-organisms. This special carbon material does not release carbon dust. Consequently the filter is constructed so that air passes through the true HEPA filter, removing airborne particles before contacting the carbon cloth. The carbon cloth is then fully available for gas, smoke and odour removal and its useful life is increased. Austin machines come with a 5 year mechanical warranty and a 5 year pro-rated filter guarantee for normal residential use. This means up to five years of top rated performance without replacing any parts. The ONLY upkeep required for Austin Air Machines is to vacuum the prefilter from outside the machine at least once per month. 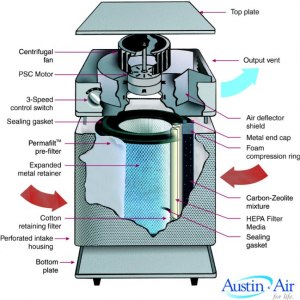 Dedicated to providing real health benefits, Austin Air machines contain NO off-gassing plastics. Austin Air housings are solidly built from perforated 23 gauge steel with a baked-on powder-coat finish. Properly sealed to prevent dirty air bypass. Four easy roll castors for simple manoeuvering. Made in the USA. Up to 1500 sq ft (139 sq metres). The smaller the area, the more effective the filtration. For effective general air cleaning this machine performs best in spaces up to 470 sq ft (44 sq metres). For relief from severe allergies and asthma this machine performs best in rooms up to 235 sq ft (22 sq metres). 8 air exchanges per hour in a 235 sq ft space (22 sq metres). 6 air exchanges per hour in a 315 sq ft space (29 sq metres). 4 air exchanges per hour in a 470 sq ft space (44 sq metres). 2 air exchanges per hour in a 940 sq ft space (87 sq metres). 360°air intake. Purified air exist through louvered vent on one side of upper deck. Permanent split capacitor mounted on shock absorbers. Rated for continuous high RPM and long life duty. Austin Air is a family owned business founded in Ontario in 1990. Today Austin Air is based in Buffalo NY where it maintains the largest manufacturing plant of its kind in the world. Get water-related tips & special discounts. Sign up for your watermatters newsletter. 80% of the earth's surface is covered in water. 97% is salt water, 2% is glacial ice. Less than 1% is available fresh water.